Hello! I am Dariel Valdano. 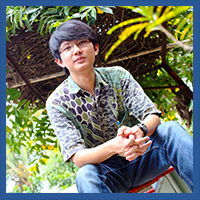 I'm a Web Designer, Embedded Programmer, a hobbyist electronics designer with a specialization in UAS, a hobbyist 3D Modeler, PC Gamer, wannabe Game Developer, Anime Enthusiast, and also a terrible Pianist living in Bandung, Indonesia. I often create websites either using CMS like Wordpress and Joomla and then custom program it, or, if total animation, speed, and interactivity is necessary, hand-craft it from (near) zero using CodeIgniter and jQuery - with this site being one example. I live in Bandung, West Java, and are currently pursuing undergraduate degree in Informatics Engineering in Institut Teknologi Bandung. I currently work as part-time Avionics Researcher in Center for Unmanned System Studies, Institut Teknologi Bandung, where I took part in the research of the IF-X/KF-X fighter jet project. You can also find me all over the internet, just look for the name "Dalva24" or "Dalva"